Closet doors are typically either solid, like other doors of a house, or folding doors. The folding-door types can also be solid or have slats. Slatted doors, or louvers, allow air to circulate in and out of a room, keeping it from getting stale or musty. This can be a helpful feature for a closet. If you are installing new slatted doors, it is better to paint them before putting them in to avoid a mess. 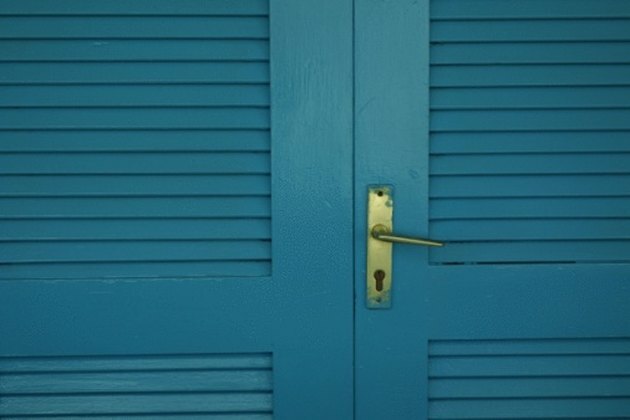 Painting slatted doors can result in missed areas if you aren't careful. Unscrew the slatted closet door from its hinges if it is already hung up. A simple screwdriver should be all you need. Detach the two folds of the door from each other by removing the hinges in the middle. This will also keep the hinges paint-free, and is a better method than covering them with tape. Wash the doors with soap and water to remove dirt, and dry them off with rags. Lay a plastic sheet out in the yard. The sheet will protect your grass from paint splatter or spills. Painting outside will keep you from dealing with fumes inside. Place the door down on the plastic. Sand down any rough areas on the wood with a fine, 220-grit sandpaper. Fill holes with wood putty and let it dry for a couple of hours. Once dry, sand the wood putty smooth to the surface of the door. Wipe the doors down with a slightly damp rag after sanding to remove dust, and let them dry out for 15 minutes or so. Paint the slats with primer. Dab the brush in the corners of the slats to coat them, then paint the length of the slats in a side-to-side motion following the grain of the wood. Use long strokes. Once the slats are done, prime the outer frame of the door that holds the slats. Follow the grain for it as well. Typically, the grain of the frame on the sides is up and down, but runs side to side at the top and bottom. Also paint primer on the edges of the door. Let it dry, then flip it over and do the other side. Paint the door with paint after you have covered it in primer on both sides. Paint in the same manner as you did the primer. Let each side dry before painting the other side. Use an enamel paint so that the doors can be scrubbed clean when they get dirty. Reinstall the doors when they dry.